What Are Your Telltales Trying to Tell You? Whether you're trimming or steering, your telltales have a lot to say and listening to them can improve your performance dramatically. Quantum's Dave Flynn explains what to look for when trimming and how to respond. There is an old sail trim adage, “trim the front of the jib and back of the mainsail,” or where the wind meets and leaves the sail plan. Telltales are a key tool helping you figure out what is going on at these critical junctures, and that is why they are placed just aft of the leading edge of the headsail and off the leech of the mainsail. There are other places you can use telltales, off the leech of a non-overlapping headsail (jib), or sometimes in the middle of a mainsail in the upper sections, but these are less critical. For a sail to work, air has to flow down both sides. Telltales tell us about that flow. Without them we are flying blind. They tell us all sorts of useful things depending on point of sail, wind velocity, and whether we are trimming or driving. Let’s start at the front of the boat and work our way back. Both hanging straight down: If both telltales are hanging straight down you’re trimmed in too far and the air isn’t getting around the sail effectively – ease out slowly. Leeward flowing aft, weather dancing: If you ease too far the leeward telltale will flow, but the inside (weather) telltale will lift up. Trim in a bit more to get them both flowing straight aft. Both flowing aft: If you’re in the sweet spot, both should flow straight back. Note: It is often hard to see the leeward telltale (especially in low light); windows are a must! Easing the sail on a reach allows the sail to open up (twist) from bottom to top. This effectively changes the angle of attack and the more open top telltale sections will indicate luffing (inside telltales lifting) well before the bottom. This is why we typically have at least three sets of telltales up the luff of a headsail. To get the top telltales to flow, move the lead position outboard and slightly forward to help the sheet pull down on the clew and close down the top sections of the sail. This is where a second sheet led to the outboard rail can come into play if that’s part of your program. Depending on how far you have to ease, you may actually end up with tension on both, shifting the balance in puffs and lulls (inboard in the lulls, outboard in the puffs) as you try to maintain perfect trim. A word of caution: you will never be able to get an eased sail to have all three sets of telltales doing the same thing on a reach. If you pull down hard enough to get the top telltales streaming aft, the bottom ones will be stalled. On a reach you have to compromise. Trim the middle of the sail perfectly. Get the middle telltales flying straight aft, allow the top inside telltale to lift some, and have the bottom outside telltale start to hang straight down - indicating stalled flow. Ignore the telltales if you are overpowered. If the boat heels too far and wants to round up into the wind, all bets are off. You don’t need maximum power anymore, so you don’t necessarily want the telltales streaming straight aft. Ease the sail until the boat is upright and on her feet. Who cares if the sail luffs? You want it to luff to shed excess power. Easing until there is flow over both sides works fine on a reach, but what happens when you want to go hard on the wind? Telltales still have a lot to tell you. First, sheeted in hard, the sail should now finally luff evenly from bottom to top. As you head up, the inside telltales at the bottom, middle, and top of the sail should lift at about the same time. If the top inside is lifting well before the bottom, the lead might need to go forward. Be careful with this rule. Generally it is always best to have the top of the sail luff just a little ahead of the bottom. When in doubt it is better to have the lead too far aft than too far forward. Letting the foot flatten out and the top twist off allows you to sheet the sail harder without stalling. The game upwind is to try to sheet the sail as hard as possible without killing all boat speed. Keep in mind the golden rule, “speed first, then point.” The sail’s distance off the spreader (or in the case of a jib how far inside the spreader tip) usually determines how far you can trim in, but telltales can provide a clue if you’re trimmed too hard. If both inside and outside telltales appear to want to break at the same time (which means the driver’s “groove” is very narrow), try easing an inch or so. Stable telltales mean a wider steering groove. The lighter the air, the more important this becomes. In very light air small changes in wind velocity mean big changes in apparent wind angle. This makes it very hard for the helmsperson to keep up. In this situation, the trimmer can help by active trimming through puffs and lulls. In a puff the outside telltale will stall and the sail will need to be eased to keep the flow. Ease and then trim gradually as the driver slowly comes back up to the new apparent wind angle. In a lull the apparent wind will go forward and the inside telltales will lift, showing luff. Over trim for a moment to keep the sail full, then ease as the driver slides down to the new angle. If you can’t see the headsail telltales there is no way to sail upwind efficiently. This is what makes cruising boats difficult to steer upwind. The wheel is usually so far aft to maximize cockpit space that it takes a Houdini like act to see them. Sometimes the only way around this is to go to leeward to steer. This is okay in light air, but not recommended in windier conditions. Once you can see the telltales, the game is pretty simple. For maximum power, the telltales need to stream straight aft. If the outside telltale spins or sags straight down head up. If the inside telltale lifts bear off. In general, it is better to ride the inside telltales, having them just on the verge of lifting. In medium air with the boat going well, it is okay to have them lifting up so that the inside telltale is at a 45 degree angle, and the leeward telltale remains straight back. With good boat speed you want to stay on the high side of the groove. Remember the adage “speed first, then point?” In light air be careful about getting too high in the groove (inside telltale lifting). Press (head down) on the jib and make sure both telltales stream aft, perhaps even allowing the outside bottom telltale to stall part of the time. Typically you are relying on the telltales in the window, the bottom set, but in light air it might be better to move your eyes up to the middle set of telltales because the bottom outside will tend to stall. This is when it is okay to steer from the leeward side to see the whole sail. Your weight down will help create needed heel anyway. If the sail is stalled at the bottom all the time in order to keep the boat moving it may just be over trimmed – ease slightly. In windier conditions telltales become less important and the angle of heel rules. As a puff hits don’t try to keep the telltales flowing, let the boat head up to maintain the same angle of heel and keep the helm pressure constant. The inside telltales will lift indicating a luffing sail. This is called “feathering.” Feather, don’t fight. Sail a constant angle of heel letting the boat come up in the puffs and bearing off to add heel in the lulls. When it comes to trimming the main off the wind the standard rule applies: let it out until it luffs along the leading edge, then trim in just enough to stop. Telltales come in handy when setting twist. With the boom eased out it begins to lift, opening or twisting the leech. If it is too open you are giving away power. Too closed and the flow will be stalled off the trailing edge. The telltales should be streaming. The vang takes care of pulling down and controlling twist on a reach, so add vang until the top telltale just begins to stall. The top telltale is the key, as it will stall first. On a deep run with the mainsail eased all the way out perpendicular to the boat (or up against the shrouds) it may not be possible to get attached flow off the back of the sails and the telltales may not be useful. In this scenario you just have to go back to keeping the top batten parallel to the boom. 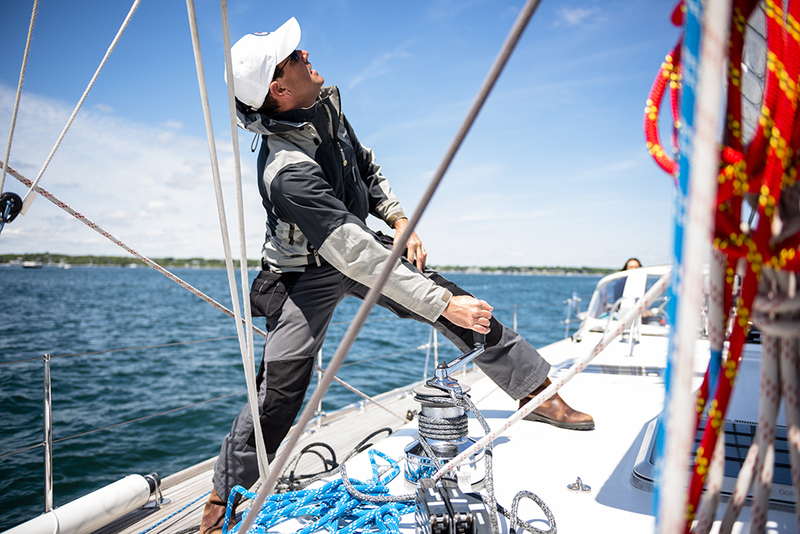 Upwind the mainsheet (sometimes helped out by the vang in windier conditions) takes over the job of controlling twist. Light Air: In light air, make sure there is flow off the back of the sail by having all the telltales flowing. More twist makes it easier for the boat to accelerate. Again, the top telltale will stall first if you are over trimmed and pulling down too hard. It is almost impossible to stall the lower telltales unless you are grossly over trimmed. Medium Air: In medium conditions you can sheet harder since the boat is now up to speed. Trim as hard as you can without slowing the boat down below target speed. The top telltale may be stalled a lot of the time. Heavy Air: In heavy air it is just a matter of keeping the boat on her feet. Ease the mainsheet to control heel and helm. The telltales will always be streaming, but they are no longer the issue. I mentioned earlier that sometimes we use telltales in addition to the ones on the luff of the jib and the leech of the mainsail. Telltales can be used on the leech to indicate flow on a non-overlapping jib. As usual, it is the top telltale that counts. Usually there is only a single telltale in the upper 25% of the leech. Trim too hard or pull the lead too far down (or too far forward) for conditions and that telltale will stall. Twist is essential in a non-overlapping sail so you always want the telltale flying. Additional telltales are also used sometimes in the upper sections of the mainsail across the middle of the sail. They help refine the twist picture and give a more subtle indication of how hard you are trimming the mainsail. They may indicate stalled flow before the leech telltale disappears. Again, they are in the top sections of the sail because that is where the sail will stall first if over trimmed. If they are too close to the mast the disturbed flow behind the spar will make them useless. Don’t fret if this feels like a lot to digest and think about while sailing, pick a section to practice during your next sail and test it out. Experiment with easing out and trimming in, as well as adjusting cars or vang, and pay attention to how things change, not only how the boat sails, but also how the telltales change. As you practice, reading your telltales and sail trim will become second nature. FOR SPORTBOAT, angle of top batten to boom, understand that top batten is open relative to boom angle upwind, comments ? It would be good to have a follow-on blog about how rig tune plays into trimming (backstay, forestay, upper/lower tension and runners if available). There are also many circumstances when the sail is out of shape (shrink with modern plastics as well as blown out) and cannot ever be trimmed "properly" according to the sailmaker's original intent. This is especially true for larger boats where sails are expensive to replace often enough.